If I Stop Paying My Student Loans, Will the Default Yield a Reasonable Settlement? I would like to know what will happen if I stop paying my student loans. I have never been unemployed and don't plan to be, but my loan payments are over $700 a month and that is unreasonable (that's over half of my monthly salary). I have tried three different jobs since graduating in the hopes of making more money, but in this economy nothing is working. I cannot save any of the money I make, so I cannot buy a house, or car, or return to graduate school. If I were to have some kind of emergency, I would go bankrupt. Despite having made every payment on time for my loans, phone bill, other bills, rent, etc., I can't even take out a line of credit to buy a sofa. I do not have a credit card or other debt. I have heard that if you stop paying your loans, your credit gets ruined, your wages get garnished, and then eventually the company will settle with you. I have federal loans and a private loan, totaling $45,000. I have tried to get my monthly payments reduced but they denied my request. What will happen if I stop paying? — Elle L. Defaulting on student loans is like taking a trip through the gates of hell, but with only limited opportunities for escaping the horrors you will find there. The lender is never going to let go of you. That promissory note you signed was a contract with the devil. After you default on your student loans, you will experience true evil. This is not the type of journey that should be undertaken if at all possible, let alone voluntarily. The terror begins with harassing phone calls and letters from the lender's minions, also known as collection agencies. Some defaulted borrowers have reported getting several dozen calls a day from a collection agency. Collection agencies are not supposed to threaten or harass you, to tell your neighbors or employer about the debt or to swear at you, but some do. Some believe that making you miserable will force you to pay your debts. One collection agency that specializes in student loans even has a large shark tank on display in its lobby. You will then be forced to pay for your sins, again and again. Up to a quarter of every payment on a federal loan (and sometimes more for private loans) is skimmed off the top to pay for collection charges before the rest is applied to outstanding interest. Only when the interest is paid off will any part of the payment be applied to reduce the principal balance. Like the travails of Sisyphus, you will be condemned to making involuntary payments on your debt for years without seeing any decrease in the principal balance of the loan. Collection charges can double the amount of time it takes to pay off your debt. The punishment feels like it is never-ending. 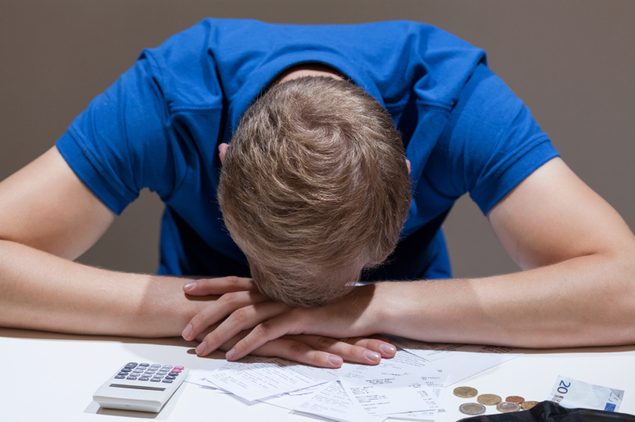 Many defaulted borrowers suffer from depression and feelings of self-loathing. The federal government gets paid one way or another. They have very strong powers to compel repayment from defaulted borrowers. The government can garnish up to 15% of your income (after subtracting amounts required by law to be withheld) without a court order. They can even garnish up to 15% of Social Security benefit payments, including both retirement benefits and disability benefits. Your income tax refunds will be intercepted to repay your loans, as will any lottery winnings. They can sue you to recover the debt. There are many other terrors they can inflict on you to force you to pay. Private lenders may not have as strong powers to compel repayment, but they can still take you to court to collect on the debt. If they get a judgment against you, they will be able to invoke a wage garnishment order and to seize assets such as bank accounts. They can also seek repayment from the cosigner, if any. A student loan default on your credit record will prevent you from getting a credit card, auto loan or mortgage. You won't be able to enlist in the Armed Forces or get a security clearance. You will find it more difficult to rent an apartment, since some landlords will check your credit history. You may even find it more difficult to get a job, since some employers will review your credit history. You may lose your job. You will never be able to get away from the debt. It is almost impossible to discharge student loans in bankruptcy. To even try, one has to file an undue hardship petition in an adversarial proceeding, a very harsh standard. If you have a sound mind in a sound body, you are extremely unlikely to get your student loans discharged. Of 72,000 federal student loan borrowers in bankruptcy in 2008, only 29 succeeded in getting all or part of their student loans discharged according to ECMC. That's 0.04%. You're more likely to die of cancer or die in a car crash than to succeed in getting your student loans discharged.